Reconnaissance party revealed the presence of oil Devonian. Near to village Setyakovo from a well at a depth of 1,533 meters oil core was raised. This primary well gave ? 15 entered the history of Kama region. That is how Bondyuga oil field was discovered. Bondyuga oilfield still was not completely utilized and developed, and drilling crew of D. Chirkin already got oil on well ?104 of new Pervomaiskiy field. At the same time well ?68 on left bank of Kama gave a powerful oil gusher; this initiated Elabuga field. On March 12, 1958 enlarged oil field was created in Kama area, and this date may reasonably be considered as the birthday of Oil and gas production department “Prikamneft”. The center of oil Kama area was Elabuga. V.M. Shesternin was appointed as director of business, A.S. Farkhutdinov was chief engineer. The main task that faced the team was trial exploitation of exploratory wells of Bondyga field. Soon works on arrangement of 10 exploratory wells and collection point at the well ? 42 were perfomed. 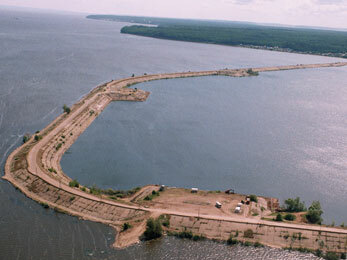 In addition to oil-gathering networks near village Ikskoie Ustie oil-loading moorage on Kama river was built. In August, after the arrangement of exploratory wells, they were put into operation. Frome this moment extraction of Kama oil started. On September 16, barge “Borovaia” with first 6600 of Kama oil pushed from oil moorage. Shipment of oil was carried out only during the period of river traffic – in winter wells were stopped. During the first year of development 22,722 tons of oil were produced. Year-round operation of wells began in 1961. With the launch of Bondyuga deposit to commercial development construction of pressure pipeline Bondyuga – Naberezhnye Chelny – Almetjevsk and water intake on Kama River, as well as houses for oil workers, was initiated. Pipeline Bondyuga – Almetjevsk with headworks in the town Naberezhnye Chelny entered into operation. Electricity was supplied to wells and collection point through high-voltage power line. With the introduction of these facilities oil production was implemented year-round. In the same year, in order to expedite settlement and development of Kama area, on the basis of Elabuga consolidated oilfield, oil field administration “Prikamneft” was established. The number of employees increased to 500, and oil production increased by more than 19 times and totalled 434.3 thousand tons per year. Office of operational drilling ? 4 of trust “Almetevburneft” was organized to drill new fields. This opens a new page in the history of oil Kama region: new wells were equipped, new fields were introduced: Pervomaysk, Elabuga, Komarovsk. New shop were organized – shop maintaining reservoir pressure, center of scientific research and design work, repair services of underground and major repair of wells. To maintain operational wells in working condition at Bondyuga field, after completion of the first pumping station, water pumping into reservoirs to maintaining reservoir pressure was started. Before the construction of treatment facilities in Tikhie mountains water for the system of shop maintaining reservoir pressure was supplied from Lake Piner, located in the floodplain of Bondyuga field. A floating pontoon with a pump was placed on the lake for water intake, and on the shore, to lift the pressure, temporary pumping station was mounted. This installation pumped 4,000 cubic meters of water into forcing wells per day. With the increment of rates of oil extraction reservoir energy began to fall down, this resulted in lowering of flow rates on producing wells. In order to move flowing wells on artificial extraction mechanical and building services were formed. Council of Ministers took a decision to build final energy cascade of Volga-Kama basin – Nizhnekamsk hydroelectric power plant. Three non-pressure dams with total length of 22,8 km and 18 freestanding special foundations were included to composition of hydrotechnical buildings. Construction of protection objects was conducted since 1965 till 1981. Hydrotechnical structures were designed to operate normally supply level 68 meters. In total 153 wells were placed on hydrotechnical structures. At the late 50's and early 60-ies a series of new fields was opened in Kama area: in 1959 – Sobolekovskoe, in 1960 – Novo-Suksinskoe, in 1961 – Kadyrovskoie, in 1962-1963 – Komarovskoe, Orlovskoie, Varzi-Omginskoe, Bastrykskoie, Zychebashskoie and Saraylinskoie fields. With start-up of capital thermochemical installation on Bondyuga field, the presence of a temporary installation at Pervomaisk field and construction on Elabuga square, the question of establishing a specialized training workshop and pumping oil arose. For its solution a processing and oil pumping shop was created, I.P. Kurmaev became its chief. At the end of 1979 Pervomaisk trade park was accepted. This solved the problem of preparing oil, and in the same year oil and gas production department reached five million annual level of oil production. The decade from 1970 to 1980 was the time of maximal annual oil production. The main deposits were located on the second stage of development. And in 1977 oil and gas production department reached maximum daily production of 16100 tons per day, and total annual production amounted 5867,2 thousand tons. In the 80'ies oil and gas production development introduces four new fields: they are Bastrykskoie, Kadyrovskoie in Zainsk region, Zychebashskoie and Biklyanskoie in Nizhnekamsk region. In 1984 100-millions ton of oil was extracted from the depths of Kama area.